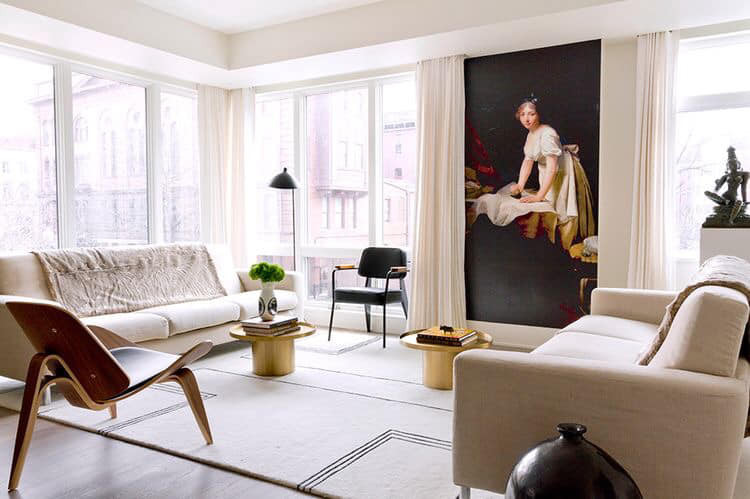 European classicism, mid-century modernism and a healthy dose of drama all combine to stunning effect in the rooms of Washington, D.C. Designed by Indian designer Raji Radhakrishnan. a 1970s Gaetano Sciolari chandelier hangs above a turn-of-the-20th-century barley-twist dining table that expands to seat 12. 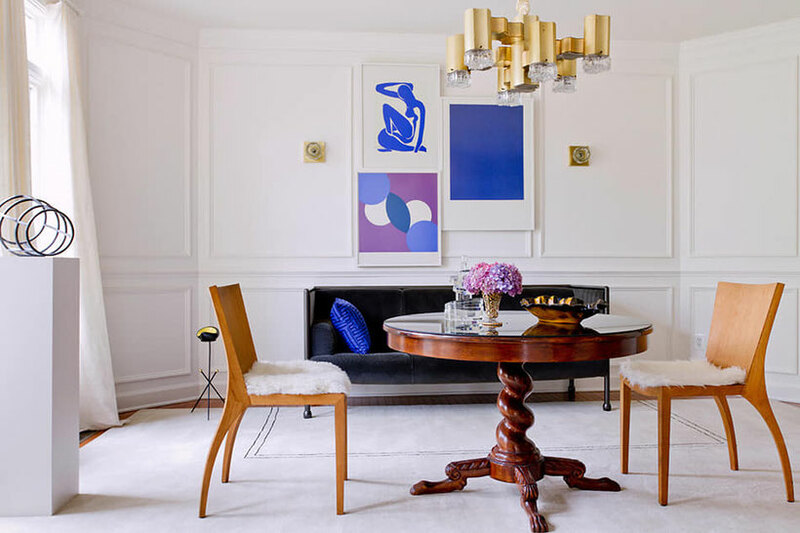 Blue serigraphs by Henri Matisse, Don Kunkel and Yves Klein are arranged over an Ettore Sottsass for Cassina sofa. The vessel sculpture is by Maryland artist Adam Curtis. a mural of the London Underground, complements and contrasts with the 1930s French sofa and ’70s coffee table. a 16th-Sculpture of the Hindu goddess Uma is juxtaposed with a custom mural of an 18th-century French painting. A Hans J. Wegner chair rests on a rug from Radhakrishnan’s collection that was customized to fit the space. in her library, Radhakrishnan painted a black swirl around the 1940s plaster light fixture by Arlus. The vintage French desk and cabinet are attributed to Dominique, and the 1960s chair is by Nanna Ditzel. The shelves hold a large book collection plus faux bois ceramics by Grandjean Jourdan and a lithograph from the “One Cent Life” portfolio, 1963–64, by Roy Lichtenstein.